(Yeah, grandiose title, I know). Anyway, this chain of thought started with me thinking about making Turner’s Cubes, and then thinking about how to obtain a perfect cube of stock to begin with. Which, honestly, is probably overkill, since as long as the stock is squared and flat for all (or at least three) faces, the rest can be handled by Stock Definition in MeshCAM. But, it got me thinking. If I did want a perfect cube, the only direct way I saw to do it was the “hard” way – face-milling the sides down for flatness, if necessary, then measuring all three dimensions, standing the tallest dimension in Z, and face-milling it down to the target magnitude, lather rinse repeat. Doable, but rather laborious. So I started wondering if there are any “pro machinist” shortcuts for making cubes. Which then lead me to wondering the same thing about spheres, cones, pyramids, dodecahedrons, tesserracts, hypercubes… you see where I’m going, here. So, I thought I’d throw it out for general comment, and see what interesting tidbits of Ancient Machining Secrets would be revealed. Machining a Turner’s cube dates from the times when all mills were manual. All one had was a mill, a vice, and parallels (precise inserts (0.0001") of various sizes one could use for simple offsets. Today, a manual mill would have an Numeric Control (NC) readout. Let’s manually manually mill first. There are many approaches. I will illustrate one. The Turner’s was a test for an apprentice. Yes, it is a lot of work. Let’s start with a piece of stock that is roughly cubical and it larger than the cube we want to machine. Say the stock is roughly 2x2x2 and we want to make a cube that is 1.75x1.75x1.75. Put the stock in the vice. Use parallels to raise the stock so the top clears the top of the vise. Use you machinists mallet to tap it down and tighten up the vice. The first face is the easiest - just mill it flat. Take off a little. Now one was one flat face. Remove the stock. Gently, every so gently, touch the top of a parallel with the tool, using a thin piece of material to protect the parallel. Set Z0. Move the tool clear of the vise. Flip the stock. Vice grip and mallet work. Set the Z0 height to 1.75. Mill off the top. The other two pairs of faces work the same way. One first makes a flat face - ever so little to take off - and the other is a precision face. The faces can be machined with a face mill or a fly cutter when one is seeking near perfection. The fly cutter will generally produce a nicer finish. Use a square end end mill for any major roughing work; leave a few thousandths for the facing tool to make perfect. Milling any flat faced platonic solid more complex than a cube is mostly an exercise in trigonometry. With a 3 axis machine, the fun comes because one needs to mill jigs to hold the stock such that the face one needs to machine in the proper orientation. So I started wondering if there are any “pro machinist” shortcuts for making cubes. 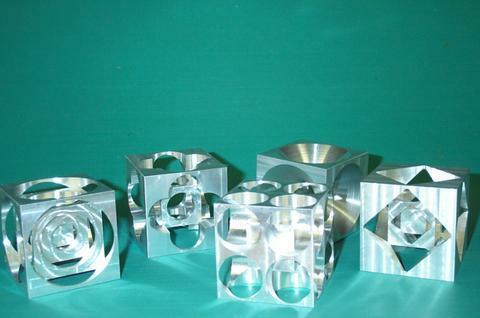 It’s all about the CNC machine one uses, the fixtures one has immediately available, and the machine tools available. Doing a cube on a 5 axis machine is is very different than a 3 axis machine. Is one limited to a vise or does one has a sea-of-holes and some fixturing gadgets? Machining curved surfaces (and spheres) are much easier with a 5 axis machine than a 3 axis machine as you might imagine. Rather than try to explain many of the methods, let us know what gadgets you want to limit the exercise to. Then we have lot of fun! For instance, with the flip jig: mill the top half of a cube - 5 and half sides - flip and do it again. This limits the quality of four sides. Clean them up if a fine finish is expected. Which version of the Turner’s are you interested in? There is the square version and the circle version. I didn’t even know there were different versions of Turner’s Cube. But, really, this was more in the line of idle speculation. Once I started thinking about the degree of stock prep work involved, my brain started chasing the rabbit, and went from cubes to “x-faced Platonic solids,” and kept thinking “there’s got to be a better way to do this, some trick I’m not seeing.” But, sounds like this is one of those things you have to do the hard way (or by making an optimized jig of some sort). For the purposes of being useful in this forum, I would think we’d want to limit ourselves to 3-axis machines, like the Nomad. Although N-axis “war stories” are always welcome! Yup. The circle version is, as far as I can tell, the original. The square version seems to have arisen during CNC times. There are actually many variants. But, sounds like this is one of those things you have to do the hard way (or by making an optimized jig of some sort). If one is trying to make true solids on a 3 axis machine - machined flat faces, not approximated - then you’re in serious jig city. Even the jigs are challenging. How does one machine an accurate angle? By making a jig to make a jig to make a part. Serious geometry and trigonometry. All of the flat faced solids are trivial in a 5 axis machine. The same is true for the curved surfaces. A good 5 axis CAM package can do “perfect normal” machining. Platonic curved solids can be made on a CNC lathe almost trivially. Curved surfaces can be made quite accurately on a 3 axis machine… the jigs are motorized using mechanical analog computers. There are mechanical tricks, based on solid mathematics, using gears and rotation points and offsets to create insane curves - parabolas, hyperbolas, etc. The curved surface techniques are well known and documented, just not things we use much anymore. They are… complicated. Serious math but - WOW! - if you’re into that it is SO cool. SO do you want to get into the Turner’s cube and some of the techniques or something else? Interesting enough, the first test I am doing on the Nomad is a Turners Cube (On the picture Mark posted, the one on the left. Basically my plan is to do one face at the Time. Im setting a Waterline mark halfway through. The plan is to machine one side, turn it over, re position and do again. Ill let you know how it goes, and ill post a picture, weather its a success or failure and post steps or tips that I used or things that went wrong. I get how you’d make two precisely parallel surfaces, but how does one make sure the angles are 90 degrees all around? If the machine makes a surface flat, it’s parallel to the machine. If one has a precision vise one takes the machined surface and puts it against the fix jaw of their vise. Machine. Two sides are now 90 degrees to each other. Rotate again and machine another surface. Rinse, repeat until done. That is way things are done on a manual mill and this is just as true on a CNC machine. A simpler version is to machine the top, flip 180 degrees. Now the flat surface is flat to the bed. Machine the top. Now the two sides are parallel. Rinse, repeat for the other pair of sides. The nice thing about these methods is they work on any sized stock and any length end mill. The key is to use as many precision surfaces as one has. With a precision vise, one has 2 or 3. IMHO the Nomad vise is not a precision vise… because I’m biased from using CMT vises which by themselves weight as much and cost as much as a Nomad. A high end vise is square and flat to ~0.0001" or better and is trammed (squared) to the bed and mill. It takes a fair amount of time to get it “right” but once there…oh! it is so nice! Machining a spoiler over the bed gives the Nomad one precision surface. The bed is pretty good but machining a spoiler flat takes the surface as far as the machine can go. Attaching the vise to the bed one has a pretty darn good precision surface on the bottom of the vise; the fix jaw is pretty good. These methods are designed to get the most one can get out of their machine. Many jobs do not require take your machine completely to edge of its abilities. Don’t go nuts unless one wants the absolute best they can get. Keep in mind machining wood to edge isn’t going to stay that way - changes in the wood happen with temperature and humidity. The fun begins when we want to avoid doing 6 flips. If the machine is square and flat (trammed) one can mill the top and 4 sides to be 90 degrees to each other (assuming the end mill is perfectly straight). One flip and the bottom can be flattened along with the rest of the 4 sides. This method is limited to the a bit less than twice the “stick out” of the end mill. Past that, we use the six flip method. How to keep the X0Y0 through the flip is a discussion for another time. Hint: a jig. several layers of pockets from 6 sides is quite simple, regardless of it being a perfect cube. but what about the “cubes” that leave the internal components free to spin about? an undercutting tool is required, and solid stabilization before the last cuts… no?